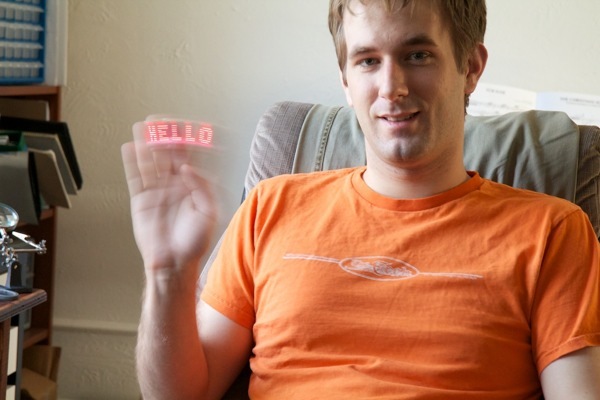 The Ice Breaker « Adafruit Industries – Makers, hackers, artists, designers and engineers! This is an idea I had a while back after making my persistence of vision toy. Unlike that though, this thing had to be small and lightweight. To accomplish this, I was going to need to etch my own PCB rather than using perfboard. That’s what this was all about. I’ll be providing a tutorial on that later. So, unlike the persistence of vision toy, I wanted this thing to have some sense of where it was in order to blink the LEDs properly. All I needed was a single trigger at a set location. I could then use the time between triggers to calculate how fast the user is waving the device around and use that frequency to attempt to blink the LEDs at the same location in every cycle. Image stability makes text much easier to read. My original thoughts were to use an accelerometer, but that presents several unknowns. For example, as the user is waving to the right, he or she might actually be slowing down slightly which would register as a leftwards acceleration. Also, accelerometers are generally fairly expensive, and I was trying to keep costs down. I decided to consult a similar gadget and do some reverse engineering.